Well, today it happened. I finally made the trek to Southern Fried Vegan (SFV) in Portland. I saw the posts of bountiful buffets, and instagrams of beautiful sammiches. And today I finally went. And today I was really bummed. I ordered the Traditional SFV Chicken Sandwich, an order of Mac N Cheese, and Kristin ordered the special – a shrimp po-boy. Let’s talk about the good part – the chicken sandwich (made of Gardein) was pretty good. It was served on what seemed like a pretzel bun and the bread, in my opinion was the best part. The fried chicken was ok, but a little bland. 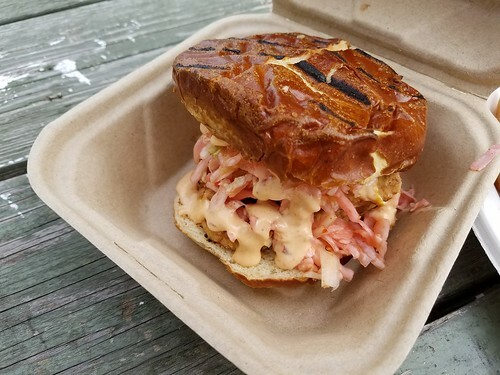 It was also served with a pink slaw which lended something, but not much to the sandwich. Another nice part was the service – the people were warm, friendly, and the service was prompt and accurate. Starting with the location. I was shocked to see the cart standing all alone in the parking lot of a liquor store and laundromat. There was one picnic table haphazardly placed right in front of the order window. The remainder of tables were out back – right next to two large dumpsters. So, that is good, as long as you like eating next to the trash. We opted to eat in the Jeep. 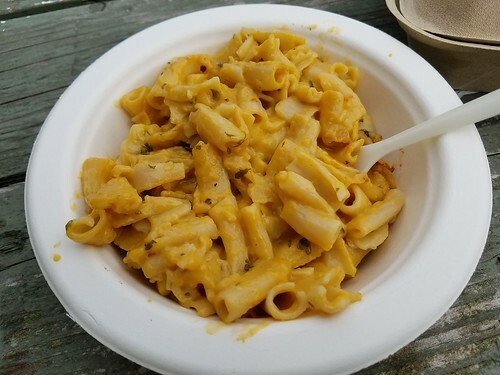 The mac and cheese was a very sad specimen of this vegan staple. It was more of a penne-noodle mush and had random potato chunks in it. It was bland, mushy, and almost inedible. 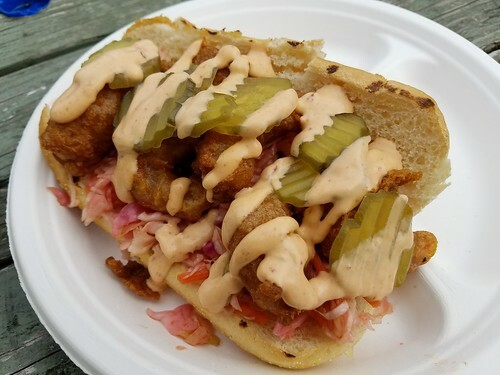 The special – the fried shrimp po-boy won the looks contest, and the shrimp was good. But the bread literally fell apart as we were eating (it literally disintegrated) and in all honesty the sandwich was bland. 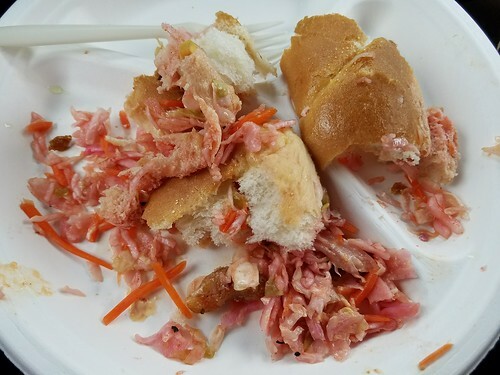 After: A pile of mushy bread and slaw. All in all I was really bummed. 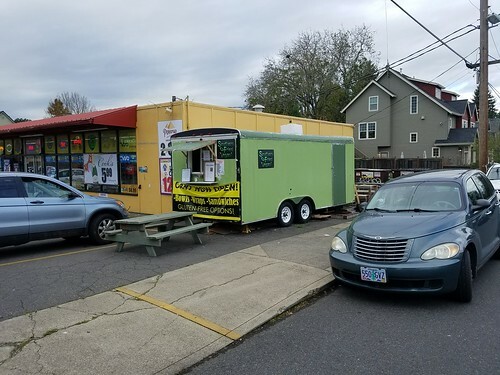 The owners of this cart need to step up their game if they plan on competing against the Homegrowns and Vtopias of Portland. The cart needs to be painted. Moved. Clean up the random wood strewn around, and improve the menu. I hate to bemoan a vegan establishment, and I wish them all the success in the World. But I also hope they re-motivate themselves into something awesome. Until then, I will steer clear. Thanks Randy. And it is too bad. 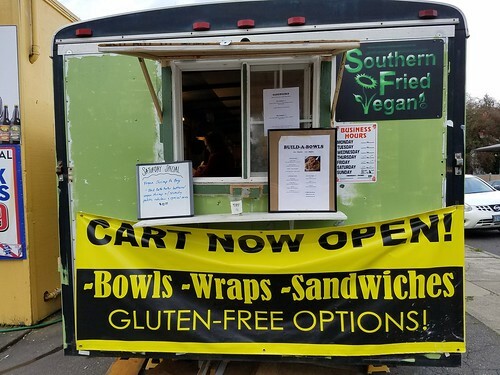 I hate seeing a vegan place that looks like it has no future. We’ll see!